In addition to opening Tanjungpinang-Jakarta route, Batavia Air also opens the route to Natuna and Pekanbaru from Tanjungpinang. 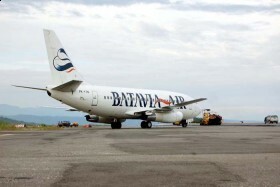 According Ditrik Manager Roni Batavia Air Imanda the Tribune, his side from the beginning had planned to open the route to Natuna and Pekanbaru. He said the route from Jakarta to Tanjungpinang_ Ranai-Tanjungpinang and return to Jakarta, is set to 4 times a week and track the Jakarta-Tanjungpinang_pekanbaru-Tanjungpinang and kembaku to Jakarta planned 3 times a week. "To point to Pekanbaru and Rannai we are still waiting, the possibility of new November we conducted," said Roni. With the plan to open lines of Batavia water Natuna and Pekanbaru, Tanjungpinang citizens no longer need to Batam for the Natuna and Pekanbaru. because the latter Riau Ariline serving these routes are no longer in operation. Members of the DPRD Riau Islands, Rudi Chua admitted welcomed by the aviation Tanjungpinang Batavia-Jakarta. He said during this society burdened with a limited flight schedule, because so far the only routes served by Sriwijaya Air. "Besides the public can choose the flight schedule, also can be cheaper because of price competition," said Rudi.